Scrabble is a board game (although it is very playable online as well) that is not only fun but can help you learn English and try your skills. 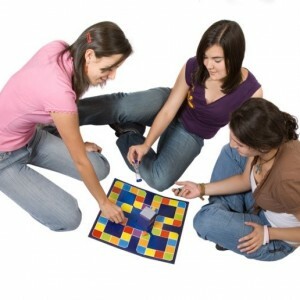 If you want to try your hand at some ESL learning games why not have a scrabble evening using the Scrabble board game. Scrabble is a board game which uses letter tiles to make words. Each letter has a point on it and when a word is made correctly, you add up the points. Players can build off other player’s words to make more points for themselves. Learning English – Because scrabble uses English letters, you can help to improve your English by spelling out words and learning how they are said and spelt. This is beneficial for those who are learning English and want to test their new found language and vocabulary skills. Make New Friends – Scrabble nights allow you to make new friends with other English language learners. Invite some native speakers so that you learn from their more extensive vocabulary words. Just make sure you tell them English is your second language. The game need not be competitive, just interesting and fun. Learning A New Game – Learning a new game and learning how to play it well it very satisfying and you can continue to improve your language skills long after you have finished you ESL course. Have Fun – Scrabble is fun and allows you to have plenty of fun no matter how old you are or where you’re from. So why not have a scrabble evening with other people who you think will enjoy themselves and enjoy the learning experience with you.